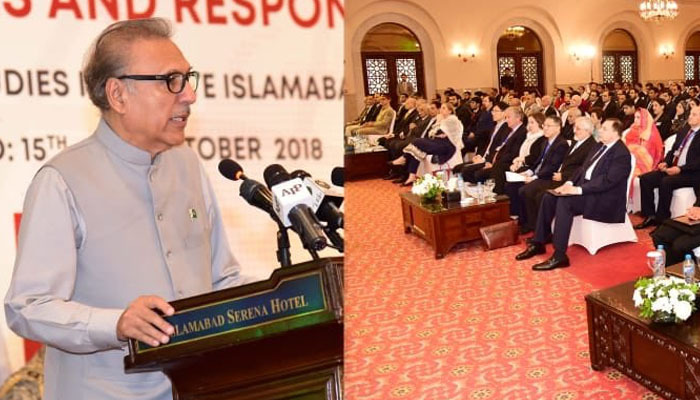 ISLAMABAD: President Dr Arif Alvi Monday said Pakistan was pursuing the peaceful use of nuclear energy and wanted to further strengthen partnership with International Atomic Energy Agency (IAEA) to ensure non-proliferation in the region. Addressing an international conference on “Global non-proliferation regime: Challenges and response” organized by the Islamabad Strategic Studies Institute here at a local hotel, the President said Pakistan was not part of any arms race in the region and its weapons programme was strictly for its defence. President Alvi said peaceful neighbourhood was linked with non-proliferation and added that increasing reliance on nuclear arms was not an encouraging scenario. He said the government of Pakistan considered socio-economic development as its priority, which could be only possible when peace in the region was ensured. He said that Pakistan fully supported the international nuclear non-proliferation regime and believed that the threat to global peace could only be addressed through mutual cooperation. He said Pakistan’s nuclear power program fully adhered to the rules and regulations of the IAEA. He mentioned that United Nations could play an important role in this regard, however stressed the need for adopting a balanced attitude towards the nuclear states. He said double standards and exceptionalism could undermine the credibility of global non-proliferation regime. Dr Alvi said a binding global framework to ensure peace and security in the region could prove helpful in nuclear non-proliferation. He said the lingering Kashmir dispute was the main reason for instability in South Asia and emphasized that Pakistan and India needed to adhere to the framework of peace and stability. Minister for Human Rights Dr Shireen Mazari said Pakistan had been confronting discrimination at international level in the domain of nuclear regimen. She mentioned that discriminatory instrument in Nuclear Suppliers Group (NSG) and policy regarding the new entrant states was a challenge.